"Tulsa" redirects here. For other uses, see Tulsa (disambiguation). Tulsa /ˈtʌlsə/ is the second-largest city in the state of Oklahoma and 45th-most populous city in the United States. As of July 2016[update], the population was 413,505, an increase of 12,591 over that reported in the 2010 Census. It is the principal municipality of the Tulsa Metropolitan Area, a region with 991,005 residents in the MSA and 1,251,172 in the CSA. The city serves as the county seat of Tulsa County, the most densely populated county in Oklahoma, with urban development extending into Osage, Rogers, and Wagoner counties. "Oil Capital of the World", "Tulsey Town", "T-Town", "Buckle of the Bible Belt", "The 918", "The Paris of Oklahoma"
"A New Kind Of Energy"
Historically, a robust energy sector fueled Tulsa's economy; however, today the city has diversified and leading sectors include finance, aviation, telecommunications and technology. Two institutions of higher education within the city have sports teams at the NCAA Division I level, Oral Roberts University and the University of Tulsa. It is situated on the Arkansas River between the Osage Hills and the foothills of the Ozark Mountains in northeast Oklahoma, a region of the state known as "Green Country". Considered the cultural and arts center of Oklahoma, Tulsa houses two art museums, full-time professional opera and ballet companies, and one of the nation's largest concentrations of art deco architecture. The city has been called one of America's most livable large cities by Partners for Livable Communities, Forbes, and Relocate America. FDi Magazine in 2009 ranked the city no. 8 in the U.S. for cities of the future. In 2012, Tulsa was ranked among the top 50 best cities in the United States by BusinessWeek. People from Tulsa are called "Tulsans". 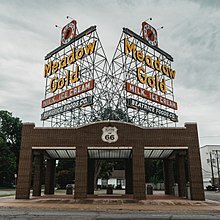 The Meadow Gold sign has greeted Route 66 travelers in Tulsa for decades. The area where Tulsa now exists was considered Indian Territory when it was first formally settled by the Lochapoka and Creek tribes in 1836. They established a small settlement under the Creek Council Oak Tree at the present day intersection of Cheyenne Avenue and 18th Street. This area and this tree reminded Chief Tukabahchi and his small group of the Trail of Tears survivors of the bend in the river and their previous Creek Council Oak Tree back in the Talisi, Alabama area. 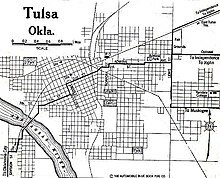 They named their new settlement Tallasi, meaning "old town" in the Creek language, which later became "Tulsa". The area around Tulsa was also settled by members of the other so-called "Five Civilized Tribes" who had been relocated to Oklahoma from the Southern United States. Most of modern Tulsa is located in the Creek Nation, with parts located in the Cherokee and Osage Nations. Although Oklahoma was not yet a state during the Civil War, the Tulsa area saw its share of fighting. The Battle of Chusto-Talasah took place on the north side of Tulsa and a number of battles and skirmishes took place in nearby counties. After the War, the tribes signed Reconstruction treaties with the federal government that in some cases required substantial land concessions. In the years after the Civil War and around the turn of the century, the area along the Arkansas River that is now Tulsa was periodically home to or visited by a series of colorful outlaws, including the legendary Wild Bunch, the Dalton Gang, and Little Britches. On January 18, 1898, Tulsa was officially incorporated and elected Edward Calkins as the city’s first mayor. Tulsa was still a small town near the banks of the Arkansas River in 1901 when its first oil well, named Sue Bland No. 1, was established. Much of the oil was discovered on land whose mineral rights were owned by members of the Osage Nation under a system of headrights. By 1905, the discovery of the large Glenn Pool (located approximately 15 miles south of downtown Tulsa and site of the present-day town of Glenpool) prompted a rush of entrepreneurs to the area's growing number of oil fields; Tulsa's population swelled to over 140,000 between 1901 and 1930. Unlike the early settlers of Northeastern Oklahoma, who most frequently migrated from the South and Texas, many of these new oil-driven settlers came to Tulsa from the commercial centers of the East Coast and lower Midwest. This migration distinguished the city's demographics from neighboring communities (Tulsa has larger and more prominent Catholic and Jewish populations than most Oklahoma cities) and is reflected in the designs of early Tulsa's upscale neighborhoods. Known as the "Oil Capital of the World" for most of the 20th century, the city's success in the energy industry prompted construction booms in the popular Art Deco style of the time. Profits from the oil industry continued through the Great Depression, helping the city's economy fare better than most in the United States during the 1930s. In the early 20th century, Tulsa was home to the "Black Wall Street", one of the most prosperous black communities in the United States at the time. Located in the Greenwood neighborhood, it was the site of the Tulsa Race Riot, one of the nation's worst acts of racial violence and civil disorder, with whites attacking blacks. Sixteen hours of rioting on May 31 and June 1, 1921, was ended only when National Guardsmen were brought in by the Governor. An official report later claimed that 23 black and 16 white citizens were killed, but other estimates suggest as many as 300 people died, most of them black. Over 800 people were admitted to local hospitals with injuries, and an estimated 10,000 black people were left homeless as 35 city blocks, composed of 1,256 residences, were destroyed by fire. Property damage was estimated at $1.8 million. Efforts to obtain reparations for survivors of the violence have been unsuccessful, but the events were re-examined by the city and state in the early 21st century, acknowledging the terrible actions that had taken place. Cain's Ballroom came to be known as the "Carnegie Hall of Western Swing" in the early 20th century. In 1925, Tulsa businessman Cyrus Avery, known as the "Father of Route 66," began his campaign to create a road linking Chicago to Los Angeles by establishing the U.S. Highway 66 Association in Tulsa, earning the city the nickname the "Birthplace of Route 66". Once completed, U.S. Route 66 took an important role in Tulsa's development as the city served as a popular rest stop for travelers, who were greeted by Route 66 icons such as the Meadow Gold Sign and the Blue Whale of Catoosa. During this period, Bob Wills and his group, The Texas Playboys, began their long performing stint at a small ballroom in downtown Tulsa. In 1935, Cain's Ballroom became the base for the group, which is largely credited for creating Western Swing music. The venue continued to attract famous musicians through its history, and is still in operation today. For the rest of the mid-20th century, the city had a master plan to construct parks, churches, museums, rose gardens, improved infrastructure, and increased national advertising. The Spavinaw Dam, built during this era to accommodate the city's water needs, was considered one of the largest public works projects of the era. In the 1950s, Time magazine dubbed Tulsa as "America's Most Beautiful City." A national recession greatly affected the city's economy in 1982, as areas of Texas and Oklahoma heavily dependent on oil suffered the freefall in gas prices due to a glut, and a mass exodus of oil industries. Tulsa, heavily dependent on the oil industry, was one of the hardest hit cities by the fall of oil prices. By 1992, the state's economy had fully recovered, but leaders worked to expand into sectors unrelated to oil and energy. In 2003, the "Vision 2025" program was approved by voters, to enhance and revitalize Tulsa's infrastructure and tourism industry. The keystone project of the initiative, the BOK Center, was designed to be a home for the city's minor league hockey and arena football teams, as well as a venue for major concerts and conventions. The multi-purpose arena, designed by famed architect Cesar Pelli, broke ground in 2005 and was opened on August 30, 2008. As seen from space, most of Tulsa lies east of the Arkansas River. Tulsa is located in the northeastern corner of Oklahoma, 99 miles (159 km) northeast of Oklahoma City; situated between the edge of the Great Plains and the foot of the Ozarks in a generally forested region of rolling hills. The city touches the eastern extent of the Cross Timbers, an ecoregion of forest and prairie transitioning from the drier plains of the west to the wetter forests of the east. 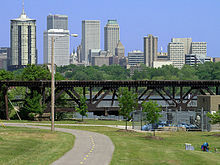 With a wetter climate than points westward, Tulsa serves as a gateway to "Green Country", a popular and official designation for northeast Oklahoma that stems from the region's green vegetation and relatively large number of hills and lakes compared to central and western areas of Oklahoma, which lie largely in the drier Great Plains region of the Central United States. Located near the western edge of the U.S. Interior Highlands, northeastern Oklahoma is the most topographically diverse part of the state, containing seven of Oklahoma's 11 eco-regions and more than half of its state parks. The region encompasses 30 lakes or reservoirs and borders the neighboring states of Kansas, Missouri, and Arkansas. The geographic coordinates of the city of Tulsa are 36°7′53″N 95°56′14″W﻿ / ﻿36.13139°N 95.93722°W﻿ / 36.13139; -95.93722 (36.131294, −95.937332), with an elevation of 700 feet (210 m) above sea level. The city developed on both sides of the prominent Arkansas River, which flows in a wide, sandy-bottomed channel. Its flow through the Tulsa area is controlled by upstream flood control reservoirs, but its width and depth can vary widely throughout the year, such as during periods of high rainfall or severe drought. A low-water dam was built to maintain a full channel at all times in the area adjacent to downtown Tulsa. This portion of the river was known as Zink Lake. However, the City of Tulsa allowed the dam to deteriorate and it no longer functions to retain the lake for which it was designed. Heavily wooded and with abundant parks and water areas, the city has several prominent hills, such as "Shadow Mountain" and "Turkey Mountain", which create varied terrain, especially in its southern portions. While its central and northern sections are generally flat to gently undulating, the Osage Hills extension into the northwestern part of the city further varies the landscape. Holmes Peak, north of the city, is the tallest point in the Tulsa Metro area at 1,360 ft (415 m) According to the United States Census Bureau, the city has a total area of 186.8 square miles (484 km2), of which 182.6 square miles (473 km2) of it is land and 4.2 square miles (11 km2) of it (2.24%) is water. The Philtower, built in the late Gothic Revival style, is surrounded by contemporary office buildings. A building boom in Tulsa in the early 20th century coincided with the rise of art deco architecture in the United States. Most commonly in the zigzag and streamline styles, the city's art deco is dotted throughout its older neighborhoods, primarily in downtown and midtown. A collection of large art deco structures such as the Mid-Continent Tower, the Boston Avenue Methodist Church, Will Rogers High School and the Philtower, have attracted events promoting preservation and architectural interest. In 2001, Tulsa served as the host city for the International Art Deco Congress, a semiannual event designed to promote art deco architecture. In addition, the city's early prosperity funded the construction of a number of elegant Craftsman, Georgian, storybook, Tudor, Greek Revival, Italianate, Spanish revival, and colonial revival homes (many of which can be found in Tulsa's uptown and Midtown neighborhoods). Building booms in later half of the twentieth century gave the city a larger base of contemporary architectural styles, including a number of buildings by famed architect Bruce Goff, who lived in Tulsa. South, East and Midtown Tulsa are also home to a number of ranch and Mid-Century Modern homes that reflect Tulsa's prosperous post-war period. The BOK Tower, built during this period, is the 2nd tallest building in Oklahoma and the surrounding states of Missouri, New Mexico, Arkansas, and Kansas. Tulsa also has the third-, and fourth-tallest buildings in the state, including the Cityplex Tower, which is located in South Tulsa across from Oral Roberts University, far from downtown. 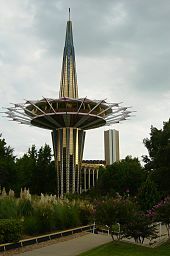 One of the area's unique architectural complexes, Oral Roberts University, is built in a Post-Modern Futuristic style, incorporating bright gold structures with sharp, jetting edges and clear geometric shapes. The BOK Center, Tulsa's new arena, incorporates many of the city's most prominent themes, including Native American, art deco, and contemporary architectural styles. Intended to be an architectural icon, the building was designed by César Pelli, the architect of the Petronas Towers in Malaysia. Downtown Tulsa is an area of approximately 1.4 square miles (3.6 km2) surrounded by an inner-dispersal loop created by Interstate 244, Highway 64, and Highway 75. The area serves as Tulsa's financial and business district, and is the focus of a large initiative to draw tourism, which includes plans to capitalize on the area's historic architecture. Much of Tulsa's convention space is located in downtown, such as the Tulsa Performing Arts Center, the Tulsa Convention Center, and the BOK Center. Prominent downtown sub-districts include the Blue Dome District, the Brady Arts district, the "Oil Capital Historic District", the Greenwood Historical District, Owen Park Historical Neighborhood, and the site of ONEOK Field, a baseball stadium for the Tulsa Drillers opened in 2010. The Arkansas River marks the division between West Tulsa and other regions of the city. The city's historical residential core lies in an area known as Midtown, containing upscale neighborhoods built in the early 20th century with architecture ranging from art deco to Greek Revival. The University of Tulsa, the Swan Lake neighborhood, Philbrook Museum, and the upscale shopping districts of Utica Square, Cherry Street, and Brookside are located in this region. A large portion of the city's southern half has developed since the 1970s, containing low density housing and retail developments. This region, marked by secluded homes and suburban neighborhoods, contains one of the state's largest shopping malls, Woodland Hills Mall, as well as Southern Hills Country Club, and Oral Roberts University. East of Highway 169 and north of 61st street, a diverse racial makeup marks the eastern portions of the city, with large Asian and Mexican communities and much of the city's manufacturing industry. 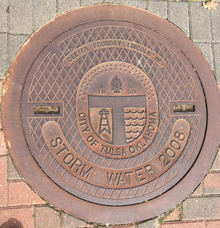 Areas of Tulsa west of the Arkansas River are called West Tulsa, and are marked by large parks, wilderness reserves, and large oil refineries. The northern tier of the city is home to OSU-Tulsa, Gilcrease Museum, Tulsa International Airport, the Tulsa Zoo, the Tulsa Air and Space Museum, and the nation's third-largest municipal park, Mohawk Park. In 2016 Walk Score ranked Tulsa 34th "most walkable" of 141 U.S. cities with a population greater than 200,000. Tulsa has a number of cycling trails, and has installed protected bike lanes downtown. Additional efforts to expand this infrastructure have been included as part of the city's "GoPlan". Tulsa has a temperate climate of the humid subtropical variety (Köppen Cfa) with a yearly average temperature of 57 °F (14 °C) and an average precipitation of just over 40 inches per year. Average monthly precipitation is lowest from December to February, and peaks dramatically in May, which averages 5.9 inches of rainfall. Early June can still be wet, but late June through the end of August is frequently dry. On average, Tulsa experiences a secondary rainfall peak in September and early October. As is typical of temperate zones, weather patterns vary by season with occasional extremes in temperature and rainfall. 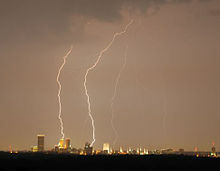 Lightning over downtown Tulsa is common in the spring months. Primarily in the spring and early summer months, the city is subjected to severe thunderstorms containing large hail, damaging winds, and, occasionally, tornadoes, providing the area with a disproportionate share of its annual rainfall. Severe weather is not limited to this season, however. For instance, on December 5, 1975, and on December 24, 1982, Tulsa experienced tornadoes. Due to its potential for major flooding events, the city has developed one of the most extensive flood control systems in the nation. A comprehensive flood management plan was developed in 1984 following a severe flood caused by a stalled weather front that dropped 15 in (380 mm) of rain overnight, killing 14, injuring 288, and destroying 7,000 buildings totaling $180 million in damage. In the early 1990s and again in 2000, the Federal Emergency Management Agency honored Tulsa as leading the nation in flood plain management. Triple-digit temperatures (≥38 °C) are observed on average 11 days per year, sometimes exceeding 100 °F (38 °C) from July to early September, usually accompanied by high humidity brought in by southerly winds; The highest recorded temperature was 115 °F (46 °C) on August 10, 1936. Lack of air circulation due to heat and humidity during the summer months leads to higher concentrations of ozone, prompting the city to release "Ozone Alerts", encouraging all parties to do their part in complying with the Clean Air Act and United States Environmental Protection Agency standards. The autumn season is usually short, consisting of pleasant, sunny days followed by cool nights. Winter temperatures, while generally mild, dip below 10 °F (−12 °C) on 3 nights, and occasionally below 0 °F (−18 °C), the most recent such occurrence being a −2 °F (−19 °C) reading on January 6, 2014. Seasonal snowfall averages 9.6 inches (24.4 cm), and, as of 2016[update], only three winters on record have officially recorded a trace or no snow, the most recent being 1910–11. The lowest recorded temperature was −16 °F (−27 °C) on January 22, 1930. A tornado struck Tulsa early on the morning of Sunday, August 6, 2017. The funnel touched down just after 1 A.M. near 36th Street and Harvard Avenue, then travelled in an easterly direction for about 6 minutes. The heaviest property damage occurred along 41st Street between Yale Avenue and Sheridan Road. Two restaurants, T. G. I. Friday's and Whataburger, were particularly hit hard, with several people being sent to hospitals for treatment. Later on, Whataburger was bulldozed. It reached an intensity of a EF3 tornado. Tulsa is sometimes considered the "buckle of the Bible Belt"; it is the home of Oral Roberts University and the university's Prayer Tower. As of the 2010 census, there were 391,906 people, 163,975 households, and 95,246 families residing in the city, with a population density of 2,033.4 inhabitants per square mile (785.1/km2) There were 185,127 housing units at an average density of 982.3 per square mile (379.2/km2). Of 163,975 households, 27% had children under the age of 18 living with them, 38.2% were married couples living together, 14.6% had a female householder with no husband present, and 41.9% were non-families. Of all households, 34.5% are made up of only one person, and 10% had someone living alone who was 65 years of age or older. The average household size was 2.34 people and the average family size was 3.04. In the city proper, the age distribution was 24.8% of the population under the age of 18, 10.9% from 18 to 24, 29.9% from 25 to 44, 21.5% from 45 to 64, and 12.9% who were 65 years of age or older, while the median age was 34 years. For every 100 females, there were 93.5 males, while for every 100 females over the age of 17 there were 90.4 males. In 2011, the median income for a household in the city was $40,268 and the median income for a family was $51,977. The per capita income for the city was $26,727. About 19.4% of the population were below the poverty line. Of the city's population over the age of 25, 29.8% holds a bachelor's degree or higher, and 86.5% have a high school diploma or equivalent. The Tulsa Metropolitan Area, or the region immediately surrounding Tulsa with strong social and economic ties to the city, occupies a large portion of the state's northeastern quadrant. It is informally known as "Green Country", a longstanding name adopted the state's official tourism designation for all of northeastern Oklahoma (its usage in relation to the Tulsa Metropolitan Area can be traced to the early part of the 20th century). The Census Bureau defines the sphere of the city's influence as the Tulsa Metropolitan Statistical Area (MSA), spanning seven counties: Tulsa, Rogers, Osage, Wagoner, Okmulgee, Pawnee, and Creek. The 2015 U.S. Census estimate shows the Tulsa MSA to have 981,005 residents In 2015, U.S. Census estimates show the Tulsa-Muscogee-Bartlesville CMSA to have 1,151,172 residents. Tulsa has a rich and diverse religious history, with notable and culturally significant communities of Christians, Jews, Muslims and others. Tulsa is part of the Southern region demographers and commentators refer to as the "Bible Belt," where Protestant and, in particular, Southern Baptist and other evangelical Christian traditions are very prominent. In fact, Tulsa, home to Oral Roberts University and to RHEMA Bible Training College (in Broken Arrow), is sometimes called the "buckle of the Bible Belt". Beyond Oral Roberts and Kenneth E. Hagin, a number of prominent Protestant Christians have lived or studied in Tulsa, including Joel Osteen, Carlton Pearson, Kenneth Copeland, Billy Joe Daugherty, Smokie Norful and Billy James Hargis. 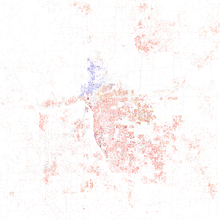 Tulsa is also home to a number of vibrant Mainline Protestant congregations. Some of these congregations were founded during the oil boom of the early twentieth century and are noted for striking architecture, such as the art deco Boston Avenue Methodist Church and First Presbyterian Church of Tulsa. While the state of Oklahoma has fewer Roman Catholics than the national average, Tulsa has a higher percentage owing in large part to the influx of Eastern and Midwestern settlers during the oil boom. Tulsa's Catholic community is atypically prominent for a Southern city and includes Governor and U.S. Senator Dewey F. Bartlett, Congressmen James R. Jones and John A. Sullivan, Governor Frank Keating, U.S. Ambassador to the Holy See Francis Rooney, and Mayors Dewey F. Bartlett, Jr., Robert J. LaFortune, Bill LaFortune and G. T. Bynum. Holy Family Cathedral serves as the Cathedral for the Diocese of Tulsa. Tulsa is also home to the largest Jewish community in Oklahoma, with active Reform, Conservative and Orthodox congregations. Tulsa's Jewish community includes several of America's most generous philanthropists including George Kaiser and Lynn Schusterman. Tulsa's Sherwin Miller Museum of Jewish Art offers the largest collection of Judaica in the South-Central and Southwestern United States. Tulsa is also home to the progressive All Souls Unitarian Church, reportedly the largest Unitarian Universalist congregation in the United States. The BOK Tower serves as the world headquarters for Williams Companies. Traditionally, Tulsa's economy has been led by the energy industry. The United States Oil and Gas Association, formerly the Mid-Continent Oil and Gas Association, was founded in Tulsa on October 13, 1917, six months after the entry of the United States into World War I. At the time Tulsa called itself "The Oil Capital of the World". At its creation, the association worked to provide petroleum to the Allied forces. In the decades since its establishment, the association is recognized as a leading advocate for producers of domestic oil and gas. Over the city's history many large oil companies have been headquartered in the city, including Warren Petroleum (which merged with Gulf Oil in what was then the largest merger in the energy industry), Skelly Oil, Getty Oil and CITGO. In addition, ConocoPhillips was headquartered in nearby Bartlesville. Industry consolidation and increased offshore drilling threatened Tulsa's status as an oil capital, but new drilling techniques and the rise of natural gas has buoyed the growth of the city's energy sector. Today, Tulsa is again home to the headquarters of many international oil and gas-related companies, including Williams Companies, SemGroup, ONE Gas, Syntroleum, ONEOK, Laredo Petroleum, Samson Resources, Helmerich & Payne, Magellan Midstream Partners, WPX Energy, and Excel Energy. Tulsa has diversified to capitalize on its status as a regional hub with substantial innovation assets. Products from Tulsa manufacturers account for about 60% of Oklahoma's exports, and in 2001, the city's total gross product was in the top one-third of metropolitan areas, states, and countries, with more than $29 billion in total goods, growing at a rate of $250 million each year. In 2006, Forbes magazine rated Tulsa as second in the nation in income growth, and one of the best cities in the country to do business with. Usually among the lowest in the nation in terms of cost of doing business, the Tulsa Metropolitan Area in 2005 was rated among the five lowest metropolitan areas in the United States for that category. Tulsa's primary employers are small and medium-sized businesses: there are 30 companies in Tulsa that employ more than 1,000 people locally, and small businesses make up more than 80% of the city's companies. During a national recession from 2001 to 2003, the city lost 28,000 jobs. In response, a development initiative, Vision 2025, promised to incite economic growth and recreate lost jobs. Projects spurred by the initiative promised urban revitalization, infrastructure improvement, tourism development, riverfront retail development, and further diversification of the economy. By 2007, employment levels had surpassed pre-recession heights and the city was in a significant economic development and investment surge. This economic improvement is also seen in Tulsa's housing trends which show an average of a 6% increase in rent in 2010. Since 2006, more than 28,000 jobs have been added to the city. The unemployment rate of Tulsa in August 2014 was 4.5%. Though the oil industry has historically dominated Tulsa's economy, efforts in economic diversification have created a base in the sectors of aerospace, finance, technology, telecommunications, high tech, and manufacturing. 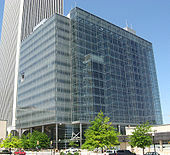 A number of substantial financial corporations are headquartered in Tulsa, the largest being the BOK Financial Corporation. Among these financial services firms are energy trading operations, asset management firms, investment funds, and a range of commercial banks. The national convenience store chain QuikTrip, fast-casual restaurant chain Camille's Sidewalk Cafe, and pizza chain Mazzio's are all headquartered in Tulsa, as is Southern regional BBQ restaurant Rib Crib. Tulsa is also home to the Marshall Brewing Company. Tulsa is also home to a burgeoning media industry, including PennWell, consumer review website ConsumerAffairs, Stephens Media Group, This Land Press, Educational Development Corporation (the parent publisher of Kane/Miller), GEB America, Blooming Twig Books, and a full range of local media outlets including such as Tulsa World and local magazines, radio and television. Tulsa is also a hub for national construction and engineering companies including Manhattan Construction Company and Flintco. A number of the Cherokee Nation Businesses are also headquartered or have substantial operations in Tulsa. Tulsa's aerospace industry is substantial and growing. An American Airlines maintenance base at Tulsa International Airport is the city's largest employer and the largest maintenance facility in the world, serving as the airline's global maintenance and engineering headquarters, while the Tulsa Port of Catoosa and the Tulsa International Airport house extensive transit-focused industrial parks. Tulsa is also home to a division of Lufthansa, the headquarters of Omni Air International, and the Spartan School of Aeronautics. Tulsa is also part of the Oklahoma-South Kansas Unmanned Aerial Systems (drone) industry cluster, a region which awarded funding by the U.S. Small Business Administration to build on its progress as a hub this emerging industry. As the second largest metropolitan area in Oklahoma and a hub for the growing Northeastern Oklahoma-Northwest Arkansas-Southwestern Missouri corridor, the city is also home to a number of the region's most sophisticated law, accounting and medical practices. Its location in the center of the nation also makes it a hub for logistics businesses; the Tulsa International Airport (TUL) and the Tulsa Port of Catoosa, connect the region with international trade and transportation. Amazon recently announced plans to build a more than 600,000-square-foot fulfillment center near Tulsa International Airport. The company will invest an estimated $130 million for this state-of-the-art facility, which will employ around 1,500 people with an annual payroll of roughly $50 million. Tulsa culture is influenced by the nearby Southwest, Midwest, and Southern cultural regions, as well as a historical Native American presence. These influences are expressed in the city's museums, cultural centers, performing arts venues, ethnic festivals, park systems, zoos, wildlife preserves, and large and growing collections of public sculptures, monuments, and artwork. Tulsa is home to several museums. Located in the former villa of oil pioneer Waite Phillips in Midtown Tulsa, the Philbrook Museum of Art is considered one of the top 50 fine art museums in the United States, and is one of only five to offer a combination of a historic home, formal gardens, and an art collection. The museum's expansive collection includes work by a diverse group of artists including Pablo Picasso, Andrew Wyeth, Giovanni Bellini, Domenico di Pace Beccafumi, Willem de Kooning, William Merritt Chase, Auguste Rodin and Georgia O'Keeffe. Philbrook also maintains a satellite campus in downtown Tulsa. In the Osage Hills of Northwest Tulsa, the Gilcrease Museum holds the world's largest, most comprehensive collection of art and artifacts of the American West. The museum includes the extensive collection of Native American oilman and famed art collector Thomas Gilcrease with numerous works by Frederic Remington, Thomas Moran, Albert Bierstadt and John James Audubon among the many displayed. On the west bank of the Arkansas River in the suburb of Jenks, the Oklahoma Aquarium is the state's only freestanding aquarium, containing over 200 exhibits, including a shark tank. In addition, the city hosts a number of galleries, experimental art-spaces, smaller museums and display spaces located throughout the city (clustered mostly in downtown, Brookside and the Pearl District). Living Arts of Tulsa, in downtown Tulsa, is among the organizations dedicated to promoting and sustaining an active arts scene in the city. Opened in April 2013, the Woody Guthrie Center in the Tulsa Arts District is Tulsa's newest museum and archive. In addition to interactive state-of-the-art museum displays, the Woody Guthrie Center also houses the Woody Guthrie Archives, containing thousands of Guthrie's personal items, sheet music, manuscripts, books, photos, periodicals, and other items associated with the iconic Oklahoma native. The archives of Guthrie protégé, singer-songwriter Bob Dylan will also be displayed in Tulsa when a new facility designed to showcase The Bob Dylan Archive is completed. With remnants of the Holocaust and artifacts relevant to Judaism in Oklahoma, the Sherwin Miller Museum of Jewish Art preserves the largest collection of Judaica in the Southwestern and South-Central United States. Other museums, such as the Tulsa Historical Society, the Tulsa Air and Space Museum & Planetarium, the Oklahoma Jazz Hall of Fame, and the Tulsa Geosciences Center, document histories of the region, while the Greenwood Cultural Center preserves the culture of the city's African American heritage, housing a collection of artifacts and photography that document the history of the Black Wall Street prior to the Tulsa Race Riot of 1921. Since 1969, public displays of artwork in Tulsa have been funded by one percent of its annual city budget. 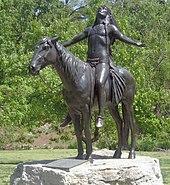 Each year, a sculpture from a local artist is installed along the Arkansas River trail system, while other sculptures stand at local parks, such as an enlarged version of Cyrus Dallin's Appeal to the Great Spirit sculpture at Woodward Park. At the entrance to Oral Roberts University stands a large statue of praying hands, which, at 60 feet (18 m) high, is the largest bronze sculpture in the world. 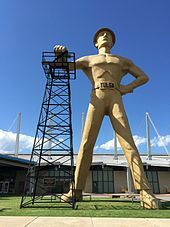 As a testament to the city's oil heritage, the 76-foot (23 m) Golden Driller guards the front entrance to the Tulsa County Fairgrounds. Tulsa has a number of exhibits related to U.S. Route 66, including The Cyrus Avery Centennial Plaza, located next to the east entrance of the historic 11th Street Bridge. The Plaza contains a giant sculpture weighing 20,000 pounds (9,100 kg) and costing $1.178 million called "East Meets West" of the Avery family riding west in a Model T Ford meeting an eastbound horse-drawn carriage. In 2020, Avery Plaza Southwest is scheduled to open, at the west end of the bridge, and should include replicas of three neon signs from Tulsa-area Route 66 motels from the era, being the Will Rogers Motor Court. Tulsa Auto Court, and the Oil Capital Motel. Tulsa has also installed "Route 66 Rising," a 70' by 30' sculpture on the road's eastern approach to town at East Admiral Place and Mingo Road. The iconic Golden Driller, built in 1953 for the 1966 International Petroleum Exposition, now stands at the Tulsa County Fairgrounds. Tulsa contains several permanent dance, theater, and concert groups, including the Tulsa Ballet, the Tulsa Opera, the Tulsa Symphony Orchestra, Light Opera Oklahoma, Signature Symphony at TCC, the Tulsa Youth Symphony, the Heller Theatre, American Theatre Company, which is a member of the Theatre Communications Group and Oklahoma's oldest resident professional theatre, and Theatre Tulsa, the oldest continuously operating community theatre company west of the Mississippi River. Tulsa also houses the Tulsa Spotlight Theater at Riverside Studio, which shows the longest-running play in America (The Drunkard) every Saturday night. Many of the world's best choreographers have worked with Tulsa Ballet including: Leonide Massine, Antony Tudor, Jerome Robbins, George Balanchine, Paul Taylor, Kurt Jooss, Nacho Duato (ten works), Val Caniparoli who is its resident choreographer (with seven works and four world premieres), Stanton Welch, Young Soon Hue, Ma Cong, Twyla Tharp and many others. In its first international tour in 2002, Tulsa Ballet was declared by the Portuguese national magazine Semanario "One of the best in the world." The company has received two feature articles in Dance Magazine during the past seven years, has been featured in the New York Times, Pointe Magazine and Dance Europe among others. In March 2008, Tulsa Ballet was featured on the cover of Pointe magazine- a distinction given to only one ballet company each year. In April 2008, Tulsa Ballet completed an ambitious $17.3 million integrated campaign, which was celebrated at the opening of the brand new Studio K; an on-site, three hundred-seat performance space dedicated to the creation of new works. Tulsa's music scene is also famous for the eponymous "Tulsa Sound" which blends rockabilly, country, rock 'n' roll, and blues and has inspired local artists like J.J. Cale and Leon Russell as well as international superstars like Eric Clapton. A number of concert venues, dance halls and bars gave rise to the Tulsa Sound but Cain's Ballroom might be the best known. Cain's is considered the birthplace of Western Swing, housed the performance headquarters of Bob Wills and the Texas Playboys during the 1930s. The centerpiece of the downtown Brady Arts District, the Brady Theater, is the largest of the city's five operating performing arts venues that are listed on the National Register of Historic Places. Its design features extensive contributions by American architect Bruce Goff. Large performing arts complexes include the Tulsa Performing Arts Center, which was designed by World Trade Center architect Minoru Yamasaki, the Cox Business Center, the art deco Expo Square Pavilion, the Mabee Center, the Tulsa Performing Arts Center for Education, and the River Parks Amphitheater and Tulsa's largest venue, the BOK Center. Ten miles west of the city, an outdoor amphitheater called "Discoveryland!" holds the official title of the world performance headquarters for the musical Oklahoma!. The city's film community hosts annual festivals such as the Tulsa United Film Festival and Tulsa Overground Film and Music Festival. The river parks trail system traverses the banks of the Arkansas River. The city's zoo, the Tulsa Zoo, was voted "America's Favorite Zoo" in 2005 by Microsoft Game Studios in connection with a national promotion of its Zoo Tycoon 2 computer game. The zoo encompasses a total of 84 acres (34 ha) with over 2,600 animals representing 400 species. The zoo is located in 2,820-acre (1,140 ha) Mohawk Park (the third largest municipal park in the United States) which also contains the 745-acre (301 ha) Oxley Nature Center. 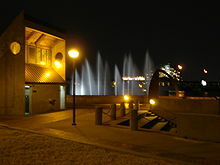 Tulsa's River Parks contain many monuments and attractions, such as these fountains. The Tulsa State Fair, operating in late September and early October, attracts over one million people during its 10-day run, and the city's Oktoberfest celebration was named one of the top 10 in the world by USA Today and one of the top German food festivals in the nation by Bon Appetit magazine. A number of other cultural heritage festivals are held in the city throughout the year, including the Intertribal Indian Club Powwow of Champions in August; Scotfest, India Fest, Greek Festival, and Festival Viva Mexico in September; ShalomFest in October; Dia de Los Muertos Art Festival in November; and the Asian-American Festival in May. The annual Mayfest arts and crafts festival held downtown was estimated to have drawn more than 365,000 people in its four-day run in 2012. On a smaller scale, the city hosts block parties during a citywide "Block Party Day" each year, with festivals varying in size throughout city neighborhoods. Tulsa has one major amusement park attraction, Safari Joe's H2O Water Park (formerly Big Splash Water Park), featuring multi-story water slides, large wave pools, and a reptile exhibit. Until 2006, the city also hosted Bell's Amusement Park, which closed after Tulsa County officials declined to renew its lease agreement. Western Swing, a musical genre with roots in country music, was made popular at Tulsa's Cain's Ballroom. The Tulsa Sound, a variation of rockabilly, blues, and rock 'n' roll, was started and largely developed by local musicians J. J. Cale and Leon Russell in the 1960s and 1970s. The Tulsa Sound heavily influenced musicians Eric Clapton and Jimmy Markham. Musicians from Tulsa or who started their musical careers in Tulsa include Garth Brooks, The Gap Band, Hanson, Caroline's Spine, Ronnie Dunn, Gene Autry, David Gates, Jamie Oldaker, Jim Keltner, Bob Wills, David Cook, Broncho, Tyson Meade, John Moreland, The Damn Quails, LANY, and JD McPherson. In 2012, Tulsa was ranked as having one of the best music scenes outside of New York, Los Angeles and Nashville. Tulsa restaurants and food trucks offer a number of cuisines, but several cuisines are particularly prominent in its culinary landscape because of its distinctive history. Tulsa is known nationally for its barbecue offerings; its barbecue reflects its midpoint location "between pig country and cow country," that is, in the transition zone between the South and the West. The city's barbecue is also helped by its geography; the wood used in barbecuing is abundant in Northeastern Oklahoma (including pecan, oak, hickory, mesquite and maple). The region's ethnic diversity is felt, too: its BBQ traditions bear the influences of white, African-American and American Indian foodways. Tulsa is also home to the nationally acclaimed premium smoker manufacturer Hasty-Bake Company. Some Tulsa based barbecue joints have expanded even beyond the state's borders, including Rib Crib and Billy Sims Barbecue. The prize-winning Oklahoma Joe's was founded by Oklahoman Joe Davidson, who mastered his craft at Tulsa's T-Town BBQ Cook-Off. Oklahoma barbecue is also unique in its emphasis on hickory-smoked baloney, nicknamed "Oklahoma tenderloin," and its fried okra. Lebanese steakhouses were once numerous in the region stretching from Bristow, Oklahoma to Tulsa, but now mostly exist in the Tulsa region. These restaurants were founded by Syrian and Lebanese families who immigrated to Oklahoma before statehood. Traditionally, many of these restaurants had live entertainment (including performers like Ella Fitzgerald and the Ink Spots) and featured Mediterranean dishes like tabbouleh, rice pilaf and hummus alongside local favorites like smoked BBQ bologna. Oklahomans have been consuming chili since well before statehood, owing to the influence of Mexican-American culture on the state. In 1910, iconic Tulsa restaurant Ike's Chili Parlor opened and Ivan "Ike" Johnson is purported to have acquired his recipe from a Hispanic-Texan named Alex Garcia. Greek immigrants to Tulsa who came by way of Brooklyn, Pennsylvania and Michigan brought with them the tradition of Coney Island-style hot dogs with chili on a bun. Today, a related group of Greek-American families operate Coney restaurants around the city, including Coney I-Lander which opened in 1926 and was described by food writers Jane and Michael Stern as perfectly delivering "the cheap-eats ecstasy that is the Coney's soul". Many of these restaurants sell Greek food, either year round or at Tulsa's annual Greek Holiday, sponsored by Holy Trinity Greek Orthodox Church (which dates to 1925). By and large, Tulsa's traditional cuisine reflects the influence of Southern foodways, particularly "upland South and... Texas where many of Oklahoma's nineteenth-century population originated." The prominence of certain foods reflects the agricultural heritage of the surrounding regions. For instance, at the suggestion of experts at what is now Oklahoma State University, peanuts became a major crop in now eastern Oklahoma as a means for lessening the reliance on cotton cultivation. Chicken-fried steak is part of the state meal of Oklahoma and is the signature dish at a number of Tulsa restaurants. The wild onion dinner is a festive gathering that originated with the Southeastern tribes which call Eastern Oklahoma home. The meals often feature wild onion, pork, frybread, corn bread, Poke salad and a unique dish known as grape biscuits. The Tulsa Indian Women's Club has been holding annual Wild Onion Dinners since at least 1932. The centerpiece of the Vision 2025 projects, the BOK Center, opened in August 2008. 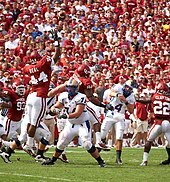 Tulsa supports a wide array of sports at the professional and collegiate levels. The city hosts two NCAA Division I colleges and multiple professional minor league sports teams in baseball, football, hockey, and soccer. Tulsa has two universities that compete at the NCAA Division I level: the University of Tulsa Golden Hurricane, and the Oral Roberts University Golden Eagles. The University of Tulsa's men's basketball program has reached the Sweet Sixteen three times, made an appearance in the Elite Eight in 2000, won the NIT championship in 1981 and 2001, and won the inaugural College Basketball Invitational in 2008. The Tulsa football team has played in 16 bowl games, including the Sugar Bowl (twice) and the Orange Bowl. Oral Roberts University's men's basketball team reached the Elite Eight in 1974 and won the Mid-Continent Conference title three straight years, from 2005 to 2007. The University of Tulsa also boasts one of the nation's top tennis facilities, the Michael D. Case Tennis Center, which was host to the 2004 and 2008 NCAA tennis championships.The Golden Hurricane Tennis program has string of success, including men's Missouri Valley championships in 1995 and 1996, men's Conference USA championships in 2006, 2007, 2008, 2009, and 2011 and women's Conference USA championships in 2007, 2008, 2010, and 2011. In 2007, Tulsa's top-ranked player Arnau Brugués-Davi ranked as high as #1 in the nation and a four time All-American, advanced to the quarterfinals of the singles competition at the NCAA Men's Tennis Championship, improving on his 2006 round of sixteen appearance. Tulsa is home to the famous Southern Hills Country Club, which is one of only two courses that have hosted seven men's major championships: three U.S. Opens and four PGA Championships, the most recent in 2007. The course has held five amateur championships and from 2001 to 2008 the LPGA had a regular tour stop, latterly known as the SemGroup Championship at Cedar Ridge Country Club. Tulsa also hosts two golf courses designed by famed golf course architect A.W. Tillinghast: the Oaks Country Club and Tulsa Country Club. The Tom Fazio-designed Golf Club of Oklahoma is located just outside of Tulsa. Karsten Creek Golf Course, host of the 2018 NCAA Men's Golf Championship, is also close, about an hour's drive west of Tulsa. Tulsa has a Class AA Texas League baseball team, the Tulsa Drillers. Famous former Drillers include Sammy Sosa, Matt Holliday, and Iván Rodríguez. In 2008, Tulsa funded 39.2 million to build a new ballpark in the Greenwood District near downtown for the Drillers. The ground breaking was held on December 19, 2008. ONEOK bought the naming rights for 10 million for the next 25 years. The first game at ONEOK Field was held on April 8, 2010. Country music star Tim McGraw threw out the first pitch. The 19,199-seat BOK Center is the centerpiece of the Vision 2025 projects and was completed in August 2008; the BOK Center was in the top ten among indoor arenas worldwide in ticket sales for the first quarter of 2009 when it was the home for the city's WNBA, arena football, and hockey teams. Tulsa is home to the Tulsa Roughnecks FC, which competes in the United Soccer League. From 1978 to 1984, the city hosted the Tulsa Roughnecks, who played in the now-defunct North American Soccer League and won that league's championship in 1983. Also in 1984, the city hosted the Oklahoma Outlaws of the now-defunct United States Football League for a single season. Saint Francis Tulsa Tough Ride and Race is a three-day cycling festival in Tulsa, Oklahoma. It features both non-competitive riding through scenic areas around the Tulsa Metropolitan Area and professional level races. It is held each year on Friday, Saturday and Sunday, the second weekend in June. Just as popular as the biking itself is the weekend-long festivities at Crybaby Hill and the Blue Dome District. At the secondary level, the Tulsa area is home to several high school athletic programs that are frequently ranked among the best nationally, particularly in football (e.g. Union High School, Booker T. Washington, and Jenks High School). The city's running and cycling communities support events such as the Tulsa Tough cycling race, the Hurtland cyclocross, the Route 66 Marathon, and the Tulsa Run, which features over 8000 participants annually. Gambling is supported by a community of Indian gaming venues that have been allowed to expand gambling options. In 2005, compacts between the state and various tribes allowed facilities to offer table card games and slot machines. Another popular gambling draw, horse racing events are housed by the Fair Meadows Race Track and Will Rogers Downs in nearby Claremore. The University of Tulsa football team competes at the NCAA Division 1 level. In motorsports, Tulsa annually hosts the Chili Bowl indoor race at the Tulsa Expo Center. It is the largest event of its kind worldwide. As of 2016[update], the city of Tulsa manages 134 parks spread over 8,278 acres (3,350 ha). Woodward Park, a 45-acre (18 ha) tract located in midtown Tulsa, doubles as a botanical gardens featuring the Tulsa Municipal Rose Garden, with more than 6,000 rose plants in 250 varieties, and the Linnaeus Teaching Gardens, which demonstrate the latest and most successful techniques for growing vegetables, annuals, perennials, woody plants and groundcovers. Tulsa River Parks is a series of linear parks that run adjacent to the Arkansas River for about 10 miles (16 km) from downtown to the Jenks bridge. Since 2007 a significant portion of the River Parks area has been renovated with new trails, landscaping and playground equipment. The River Parks Turkey Mountain Urban Wilderness Area on the west side of the Arkansas River in south Tulsa is a 300-acre area that contains over 45 miles of dirt trails available for hiking, trail running, mountain biking and horseback riding. The Tulsa City Hall serves as the base for most city government functions. A mayor-council government has been in place in Tulsa since 1989 when the city converted from a city commission government deemed wasteful and less efficient. Since the change, Tulsa mayors have been given more power in accordance with a strong mayoral system and have greater control of a more consolidated array of governmental branches. Plurality voting is used to elect mayors, who serve a term in office of four years. The present mayor of Tulsa is Republican G. T. Bynum who won the 2016 mayoral election and took office on December 5, 2016. Another Tulsa political figure, Jim Inhofe, who now represents Oklahoma in the United States Senate, served as the mayor of Tulsa early in his political career. A city councilor from each of the city's nine council districts is elected every two years, each serving a term of two years. Councilors are elected from their own respective districts based on a plurality voting system, and serve on the Tulsa City Council. As a whole, the council acts as the legislative body of city government, which aims to pass laws, approve the city budget, and manage efficiency in city government. In accordance with the mayor-council form of government, the Tulsa City Council and the office of the Mayor coordinate in city government operations. A third body of the government, the city auditor, is elected independently of the city council and mayor to ensure that the auditor can act in an objective manner. The auditor is elected for a term of two years. Phil Wood, a Democrat, held the position for 21 years before being defeated by Republican Preston Doerflinger in the 2009 election. The city serves as the seat of county government for Tulsa County, and lies mostly within Oklahoma's 1st congressional district, with its far northwestern areas in southern Osage County in Oklahoma's 3rd congressional district. Municipal and State laws are enforced in Tulsa by the Tulsa Police Department, an organization of 781 officers as of 2012[update]. The McFarlin Library serves the University of Tulsa campus. The Presbyterian Church (PCUSA) established the Presbyterian Mission Day School, a one-story building at what would become 4th Street and Boston Avenue in 1884. A second story was soon added to accommodate the number of children who were to attend. This school operated until 1889. When Tulsa incorporated in 1899, it took over the school and became the first public school. James M. Hall and three other men bought the property with their own funds and held the title until the city could reimburse them. Tulsa built its first two public schools in 1905. Construction of more schools began accelerating in 1906. In December 1907, control of the public schools passed from the city government to the Tulsa Board of Education. Tulsa High School opened in 1906 on the same block formerly occupied by the Presbyterian mission school, which had been razed. The new school was a three-story cream colored brick building with a dome. The school was accredited by the North Central Association of Schools and Colleges in 1913. It proved too small by 1916, when Tulsa voters approved a bond issue to construct a new high school at Sixth Street and Cincinnati Avenue, which was renamed Central High School. The north half of this facility opened in 1917, while the south half opened in 1922. This building remained in this service until 1976, when it was replaced by a new building on West Edison Street. The old building was taken over by the Public Service Company of Oklahoma. There are three primary public school districts in the city of Tulsa. Tulsa Public Schools, with nine high schools and over 41,000 students, is the second-largest school district in Oklahoma and includes Booker T. Washington High School, a magnet school judged to be the 65th best high school in the United States by Newsweek magazine in 2008. Each with one upper high school, Jenks and Union schools are the city's two other primary districts, covering the southern portion of the city near the towns of Jenks and Broken Arrow. In 2006, there were more than 90,000 students attending Tulsa County's public schools. A variety of independent and sectarian schools exist in Tulsa, also. Most, but not all, of the private schools have religious affiliations with various Christian, Jewish or Muslim denominations. The Catholic Diocese of Tulsa supports a system of parochial and diocesan schools, including Bishop Kelley High School, administered by the LaSallians (French Christian Brothers). Another Catholic high school, Cascia Hall Preparatory School, is administered by Augustinians. Holland Hall School is independent but historically affiliated with the Episcopal Church. Riverfield Country Day School is non-sectarian. The largest library system in the Tulsa Metropolitan Area, the Tulsa City-County Library, contains over 1.7 million volumes in 25 library facilities. The library is active in the community, holding events and programs at most branches, including free computer classes, children's storytimes, business and job assistance, and scholarly databases with information on a variety of topics. The McFarlin Library at the University of Tulsa is a federal depository library holding over three million items. Founded in 1930, the library is known for its collection of Native American works and the original works of Irish author James Joyce. The Tulsa City-County Library and the University of Tulsa's Law Library are also federal depository libraries, making Tulsa the only city in Oklahoma with more than two federal depository libraries. The Tulsa City County Library's Downtown branch was massively renovated and opened to the public on Saturday, October 1, 2016. The first institute of higher education was established in Tulsa when Kendall College, a Presbyterian school, moved from Muskogee to Tulsa in 1907. In 1920, the school merged with a proposed McFarlin College to become the University of Tulsa (abbreviated as TU). The McFarlin library of TU was named for the principal donor of the proposed college, oilman Robert M. McFarlin. The Graduate Center houses Oral Roberts University's graduate college. 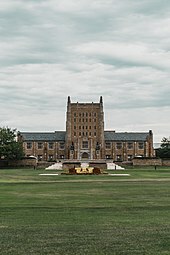 Tulsa has 15 institutions of higher education, including two private universities: the University of Tulsa, a school founded in 1894, and Oral Roberts University, a school founded by evangelist Oral Roberts in 1963. The University of Tulsa has an enrollment of 4,192 undergraduate and graduate students and is ranked 83rd among national doctoral universities in U.S. News and World Report's 2009 edition of America's Best Colleges and among the best 123 Western Colleges by the Princeton Review in 2007, which also ranks it in the top ten schools nationally for quality of life, overall happiness of students, and relationship with the community. In addition to doctoral and masters programs, TU is home to the University of Tulsa College of Law and the Collins College of Business. TU also manages the famous Gilcrease Museum in northwest Tulsa and hosts the Alexandre Hogue Gallery on its main campus. Oral Roberts University, a charismatic Christian institution with an enrollment of 5,109 undergraduate and graduate students, was rated in 2007 by the Princeton Review one of the 123 best in the Western United States and among the West's top 50 Master's Universities by U.S. News and World Report in 2005. Prominent ORU alumni include Kathie Lee Gifford, Joel Osteen and Ryan Tedder. Oklahoma State University houses three campuses in the city, the OSU Center for Health Sciences, the OSU College of Osteopathic Medicine, and OSU – Tulsa, accommodating upper-level undergraduate and graduate courses. OSU-Tulsa has an advanced materials research facility and is home to the Oklahoma Center for Poets and Writers. The University of Oklahoma operates what is known as the OU-Tulsa Schusterman Center, offering bachelors, master's and doctoral degree programs in conjunction with the main campus in Norman and the OU Health Sciences Center in Oklahoma City. The OU-Tulsa Schusterman Center also houses the OU School of Community Medicine, the first medical school of its kind in the United States. Rogers State University in Claremore, Oklahoma is the Tulsa area's original public, undergraduate-focused, four-year university. Tulsa Community College (TCC), the largest community college in Oklahoma, operates four campuses spread across the area as well as a conference center in Midtown, and has a partnership allowing students to complete four-year bachelor's degrees through OU-Tulsa, OSU-Tulsa, LU-Tulsa and NSU-Broken Arrow. Tulsa also has a Tulsa branch of Langston University, the only historically black college or university in the state, founded in 1897. Tulsa previously had a branch campus of St. Gregory's University, a Catholic university with its main campus in Shawnee, Oklahoma; however, that school went into bankruptcy in 2017. The Spartan School of Aeronautics enrolls 1,500 students at its flight programs near Tulsa International Airport and the city's vocational education is headed by Tulsa Technology Center, the oldest and largest vocational technology institution in the state. Virginia College is a school focusing on career training in Business and office, Health and Medical and Network Engineering and has a campus in Tulsa. The college offers day and night classes, several of which are available online. Among trade schools located in Tulsa are Community Care College (including branches Oklahoma Technical College and Clary Sage College), and Tulsa Tech. The Tulsa World operates primarily from its headquarters in downtown Tulsa. Tulsa's leading newspaper is the daily Tulsa World, the second most widely circulated newspaper in Oklahoma with a Sunday circulation of 189,789. The Tulsa Voice is an Alt-Weekly newspaper covering entertainment and cultural events. Covering primarily economic events and stocks, the Tulsa Business Journal caters to Tulsa's business sector. Other publications include the Oklahoma Indian Times, the Tulsa Daily Commerce and Legal News, the Tulsa Beacon, This Land Press, and the Tulsa Free Press. A regional magazine of national stature, Preview 918 has remained the most trusted and widely read lifestyle publication in the Tulsa area for more than 30 years. Each month, Preview 918 connects with over 200,000 readers covering dining, fitness, retail, services, entertainment, people, events, lifestyles and the arts. Complimentary copies of Preview 918 are distributed to over 650 locations in the Tulsa and Green Country. Until 1992, the Tulsa Tribune served as a daily afternoon newspaper competing with the Tulsa World. The paper was acquired by the Tulsa World that year. Urban Tulsa Weekly served as the city's alt-weekly paper from 1991 until its closure in 2013. Tulsa is also served by television and radio broadcasting networks. All major U.S. television networks are represented in Tulsa through local affiliates in the designated market area (a region covering a 22-county area serving the northeastern and east-central portions of Oklahoma, and far southeastern Kansas); these include NBC affiliate KJRH-TV (channel 2), CBS affiliate KOTV-DT (channel 6), ABC affiliate KTUL (channel 8), PBS station KOED-TV (channel 11, a satellite of the state-run OETA member network), CW affiliate KQCW-DT (channel 19), Fox affiliate KOKI-TV (channel 23), MyNetworkTV affiliate KMYT-TV (channel 41), Ion Television owned-and-operated station KTPX-TV (channel 44). The market is also home to several religious stations including TBN owned-and-operated station KDOR-TV (channel 17), religious/secular independent station KWHB (channel 47), and Oral Roberts University-owned KGEB (channel 53, which is distributed nationwide via satellite as GEB America). Cable television service in the area is provided by Cox Communications, which acquired Tele-Communications Inc. (TCI)'s franchise rights to the area in a $2.85-billion deal (which also included the purchase of AT&T Broadband's Louisiana cable systems, minority ownership of TCA Cable TV systems in Texas, Louisiana and New Mexico, and TCI's Peak Cablevision systems in four other Oklahoma cities, and select markets in Arkansas, Utah and Nevada) in July 1999; Cox assumed control of TCI's Tulsa-area systems on March 15, 2000. As in most major American cities, local radio stations in the Tulsa area are controlled by a small handful of large broadcasting companies. The late radio personality Paul Harvey was born in Tulsa and worked at local radio station KVOO in his early career. The Tulsa Transit bus network, operating from its Denver Avenue Station transit center in downtown, helps meet city infrastructure needs. Transportation in Tulsa is aided by Tulsa Transit's bus network of 97 vehicles and two primary airports, while the Tulsa Port of Catoosa provides transportation of goods and industry through international trade routes. Though internal transportation is largely dependent on automobiles, the city is consistently ranked in the five lowest metropolitan areas for average price of gas at the pump. Tulsa has an extensive highway system that connects drivers to many cities in the region such as Joplin, Missouri on the Will Rogers Turnpike and Oklahoma City on the Turner Turnpike. Most commuters use the highway system in Tulsa to get to and from work. Highways that run through Tulsa are I-44, I-244, US-412, US-169, OK-66, US-64, US-75, OK-11, OK-51, Creek Turnpike, and Gilcrease Expressway. In 2011, the Oklahoma Department of Transportation reported that Tulsa's busiest freeway was US-169 with about 121,500 vehicles daily between 51st and 61st Streets, and its second busiest freeway was OK-51 with about 104,200 vehicles between Memorial and I-44. Surrounding Downtown is the Inner Dispersal Loop (sometimes called the "I-D-L"), which connects Downtown with almost all the highways in Tulsa. Tulsa Transit, the city's transit bus operator, runs 97 buses on 19 different routes across Tulsa and in surrounding suburbs such as Broken Arrow, Sand Springs and Jenks. Tulsa Transit has two stations: the Memorial Midtown Station at 7952 E. 33rd St. in Midtown Tulsa, and the Denver Avenue Station at 319 S. Denver, across from the BOK Center in Downtown. Most routes go through one or both of the stations, facilitating the commute to work and events in Downtown or Midtown. Buses stop at specific stops such as Tulsa Community College, Oklahoma State University-Tulsa, CityPlex Towers, Cox Communications, the various medical facilities in Tulsa, and many shopping destinations, hotels, and schools. The bus schedules are periodically changed; votes are taken by Tulsa Transit to help decide what are the best specifics for certain routes. Tulsa is also implementing a Bus Rapid Transit (BRT) line along Peoria Avenue from 54th Street North to 81st Street South which will feature more frequent buses, upgraded stations, and faster travel times, one of the first 12 cities to adopt such a system. Intercity bus service is provided by both Greyhound Lines and Jefferson Lines. The station for both is at 317 S. Detroit, 5 blocks from Tulsa Transit's Downtown bus terminal. As to private chartered bus companies, Red Carpet Charters a/k/a Red Carpet Trailways of Tulsa is an independent member of the Trailways Charter Bus Network. The Tulsa International Airport, which is home to nine commercial airlines, serves more than three million travelers annually, with almost 80 departures every day. In 2007, the airport completed most of an expansion project, which included larger terminal sizes and the addition of restaurants and shops. In 2011, the airport opened the newly-renovated Concourse B, complete with skylights, open gate holds, an average of 76 ways to charge a device per gate, and much more. Concourse A is under renovation. Richard L. Jones, Jr. Airport, a/k/a Jones-Riverside Airport, a general aviation airport in West Tulsa, saw 335,826 takeoffs and landings in 2008, making it the busiest airport in Oklahoma and the fifth-busiest general aviation airport in the nation. Its operations contribute over $3.2 million to the economy annually. The Tulsa Airports Improvement Trust also manages the Okmulgee Regional Airport in Okmulgee, Oklahoma, further to the south of Tulsa. Freight railways bisect the city in every direction; the state’s chief freight rail transporter is BNSF, which operates the Cherokee Rail Yard in Tulsa, which includes a freight terminal, diesel shop and hump yard for railcar sorting. Other Class I transporters are Union Pacific Railroad, and Kansas City Southern Railway (via a short-line switch on the South Kansas and Oklahoma Railroad). Historically, Tulsa Union Depot had been a hub for passenger trains to diverse locations in the Midwest and the Southwest. There are no mass transit rail lines in Tulsa, but the prospect of passenger rail lines from Downtown Tulsa to the suburb of Broken Arrow is being studied. 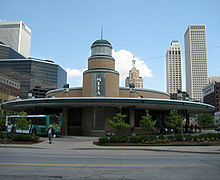 Long distance passenger rail transportation serves Tulsa only through Greyhound bus lines, which provide bus connections to nearby cities with Amtrak stations. Beginning in February 2014, a limited number of test trips of the Eastern Flyer were run, connecting the Tulsa and Oklahoma City metros via train on Sundays. The private passenger operation by the Iowa Pacific was at one point scheduled for regular daily operations from May 2014, but never started; and Iowa Pacific has since dropped out of the process. However, demonstrations of the Eastern Flyer may go forward under the Stillwater Central Railroad, due to contractual provisions of its 2014 purchase from the State of Oklahoma of the “Sooner Sub” trackage running from Sapulpa, Oklahoma near Tulsa to Del City, Oklahoma near Oklahoma City. Tulsa has two static displays of antique steam railroad locomotives for free public viewing: the 1917 wood-burning Dierks Forest 207, a Baldwin 2-6-2 Prairie-type located at the Tulsa State Fairgrounds; and, the 1942 oil-burning Frisco Meteor 4500, a Baldwin 4-8-4 Northern-type at the Route 66 Historical Village at 3770 Southwest Blvd. At the head of the McClellan-Kerr Arkansas River Navigation System, the Tulsa Port of Catoosa is an inland port in the United States and connects barge traffic from Tulsa to the Mississippi River via the Verdigris River and the Arkansas River. The facility is one of the largest riverports in the United States and contributes to one of the busiest waterways in the world via its course to the Gulf of Mexico. In 2010 Saint Francis completed a new Children's Hospital. The Saint Francis Health System owns several hospitals with a central location at Saint Francis Hospital in the southern part of the city. The facility contains 700 doctors and 918 beds, and with more than 7,000 employees, the network is the second-largest healthcare employer in the state. The health system also operates a heart hospital, which was named by General Electric in 2004 one of the most advanced heart hospitals in the nation. St. John Medical Center, located in an 11-story midtown center, employs nearly 700 doctors. Other networks, such as Hillcrest Health System, operate a number of facilities in varying sizes. Beginning in 2007, the city elected to renew a five-year contract with EMSA for ambulance service after a period of consideration to switch to the Tulsa Fire Department for providing such services. Several films starring "Brat Pack" actors were filmed in Tulsa in the early 1980s: among them were Tex (1982), The Outsiders (1983), Rumble Fish (1983) and Fandango (1985). ^ a b c d e f "American FactFinder". United States Census Bureau. Retrieved July 21, 2015. ^ "Population Estimates". United States Census Bureau. Archived from the original on April 17, 2016. Retrieved July 21, 2015. ^ "Zip Code Lookup". USPS. Archived from the original on January 1, 2008. Retrieved August 30, 2014. ^ a b "Tulsa (city) QuickFacts from the US Census Bureau". United States Census Bureau, Population Division. June 28, 2007. Retrieved September 23, 2013. ^ a b "Metropolitan and Micropolitan Statistical Areas". United States Census Bureau. June 24, 2016. Retrieved June 24, 2016. ^ "Tulsa County". Oklahoma Historical Society. Retrieved July 31, 2010. ^ a b c d Everly-Douze, Susan (August 27, 1989). "What's Doing in Tulsa?". New York Times. Retrieved April 14, 2007. ^ a b "Business Opportunities". Tulsa Metro Chamber of Commerce. Archived from the original on September 1, 2006. Retrieved April 14, 2006. ^ Kapoor, Tarun (April 19, 2007). "Business Viewpoint: Private sector plays big downtown role". Tulsa World. Retrieved May 5, 2007. ^ "Tulsa, Oklahoma: Recreation". City Data. 2006. Retrieved May 6, 2007. ^ "Quality of Life – Fun and Play". Oklahoma Department of Commerce. 2006. Archived from the original on June 27, 2007. Retrieved July 15, 2006. ^ "Tulsa, Oklahoma". Most Livable. About Partners. 2006. Archived from the original on July 3, 2006. Retrieved July 15, 2006. ^ "Most Livable Cities: Tulsa, Oklahoma". Forbes: Most Livable Cities. April 1, 2009. Retrieved April 1, 2009. ^ "Relocate America's: Tulsa, Oklahoma". Relocate America's: Most Livable Cities. Relocate America's. 2009. Archived from the original on August 3, 2009. Retrieved April 1, 2009. ^ "Tulsa, OKC rank high for future". Tulsa World. June 6, 2009. Retrieved June 4, 2013. ^ "America's 50 Best Cities - The Best Places to Live - Businessweek". Images.businessweek.com. Retrieved June 4, 2013. ^ a b "Tulsa Area History". Tulsa County Library. Archived from the original on January 8, 2007. Retrieved April 25, 2007. ^ a b Smith, Jeff (September 15, 2005). "Tulsa County History". Roots Web. Archived from the original on October 19, 2007. Retrieved April 27, 2007. ^ Gibson, Campbell (June 1998). "Population of the 100 Largest Cities and Other Urban Places in the United States: 1790 to 1990". Archived from the original on March 14, 2007. Retrieved April 29, 2007. ^ a b c Ball, Rex; Jennifer Young. "What's Doing in Tulsa?". Tulsa City-County Library. Archived from the original on December 2, 2006. Retrieved April 25, 2007. ^ a b c d Ellsworth, Scott. "The Tulsa Race Riot". Tulsa Reparations. Archived from the original on December 10, 2013. Retrieved April 20, 2007. ^ Sulzberger, A.G. (June 20, 2011). "As Survivors Dwindle, Tulsa Confronts Past". The New York Times. Retrieved June 20, 2011. ^ a b c Elliott, Matt (March 25, 2007). "Cain's Ballroom – A Music Icon: Venue is a landmark for Western swing, punk fans". Tulsa World. Retrieved April 20, 2007. ^ "The Father of Route 66". University of Virginia. Retrieved April 20, 2007. ^ "Birthplace of Route 66: Tulsa, OK". June 22, 2009. Archived from the original on July 24, 2012. Retrieved July 28, 2010. ^ "Tulsa's History". Tulsa Web. Archived from the original on February 21, 2007. Retrieved May 7, 2007. ^ a b c "Oil and Gas Briefing" (PDF). Oklahoma Department of Commerce. January 23, 2006. Archived from the original (PDF) on June 14, 2007. Retrieved April 27, 2007. ^ "BOK Center". Tulsa Convention and Visitors Bureau. Archived from the original on May 9, 2007. Retrieved April 20, 2007. ^ "Opening of BOK Center draws thousands downtown," Tulsa World, August 30, 2008. ^ "The Ancient Cross Timbers". University of Arkansas. Archived from the original on September 8, 2006. Retrieved May 3, 2007. ^ Clapman, Leah (September 24, 2004). "Key Races: Oklahoma Senate". PBS. Retrieved April 30, 2007. ^ "Oklahoma, The All-Terrain Vacation". Oklahoma Department of Tourism. Archived from the original on July 9, 2006. Retrieved April 20, 2007. ^ "Northeast Oklahoma's Green Country". Oklahoma Department of Tourism. Archived from the original on September 30, 2007. Retrieved April 30, 2007. ^ "Northeast Oklahoma Lakes". Green Country Marketing Association. Archived from the original on September 27, 2007. Retrieved April 30, 2007. ^ "Low-water dam lake to honor Zinks". ^ Collins, Gretchen. "River Parks Proves Practical Need for Visionary Ideas". Urban Tulsa Weekly. Archived from the original on September 28, 2007. Retrieved April 30, 2007. ^ "Osage County High Point". Peakbagger.com. November 1, 2004. Retrieved June 4, 2013. ^ "International Art Deco Congress". artdecobrasil.com. Archived from the original on December 9, 2012. Retrieved August 7, 2010. ^ Gill, Richie (October 6, 2006). "Tallest Buildings by U.S. State". All About Skyscrapers. Archived from the original on January 11, 2007. Retrieved April 14, 2007. ^ "About Oklahoma". Oklahoma Department of Tourism and Recreation. 2007. Archived from the original on May 17, 2007. Retrieved April 29, 2007. ^ Barber, Brian (September 28, 2004). "Leaders praise arena design". Tulsa World. Retrieved May 7, 2007. ^ "Arena Schematic Design Presented". Vision 2025. 2006. Archived from the original on September 28, 2007. Retrieved May 7, 2007. ^ "Quick Facts". Downtown Tulsa Unlimited. Archived from the original on May 2, 2007. Retrieved April 14, 2007. ^ "Walk to tie city's projects together". Land Legacy. December 25, 2005. Archived from the original on March 9, 2007. Retrieved April 14, 2007. ^ Lassek, PJ (June 25, 2008). "Tulsa Drillers stadium coming downtown to Greenwood District". Tulsa World. Retrieved September 19, 2008. ^ Lassek, PJ (December 19, 2008). "City breaks ground on downtown ballpark". Tulsa World. Retrieved December 19, 2008. ^ Lassek, PJ (January 13, 2009). "Baseball park named Oneok Field". Tulsa World. Retrieved January 13, 2009. ^ a b "Zoo History". Tulsa Zoo and Living Museum. Archived from the original on September 28, 2006. Retrieved April 15, 2006. ^ "Most Walkable Cities in the US". Walk Score. 2016. Archived from the original on January 31, 2017. Retrieved May 4, 2017. ^ "Tulsa Area Trails Guide". INCOG. Retrieved January 31, 2019. ^ ""Protected bike lanes" Coming to Downtown Tulsa for First Time". Amy Slanchik, Newson6.com, March 10, 2017. Retrieved January 31, 2019. ^ Slanchik, Amy. "'Protected Bike Lanes' Coming To Downtown Tulsa For First Time". Retrieved May 4, 2017. ^ "Go Plan | Tulsa Transportation Resource Center". tulsatrc.org. Archived from the original on October 28, 2016. Retrieved May 4, 2017. ^ a b c d "Climate of Tulsa County" (PDF). Oklahoma Climatological Survey. p. 1. Archived from the original (PDF) on September 2, 2006. Retrieved April 26, 2006. ^ "Historical Weather for Tulsa, Oklahoma, United States of America". Weatherbase. 2007. Retrieved April 26, 2007. ^ a b c "Flooding History". City of Tulsa. 2005. Retrieved May 8, 2007. ^ "FEMA Honors Tulsa, Oklahoma As Nation's Leading Floodplain Management Community". Federal Emergency Management Agency. September 13, 2000. Archived from the original on September 26, 2007. Retrieved April 28, 2007. ^ a b "Autumn Climatology for Eastern Oklahoma and Northwest Arkansas". National Weather Service. Retrieved April 30, 2006. ^ Tulsa World. "Tulsa's temperatures, water usage continue to soar". ^ "Ozone Alert! Program Data and Monitoring". Tulsa Ozone Alert. Archived from the original on May 28, 2006. Retrieved April 30, 2006. ^ a b c "Station Name: OK TULSA INTL AP". National Oceanic and Atmospheric Administration. Retrieved March 10, 2013. ^ a b c "NowData – NOAA Online Weather Data". National Oceanic and Atmospheric Administration. Retrieved February 1, 2012. ^ "WMO Climate Normals for TULSA/WSO AP OK 1961–1990". National Oceanic and Atmospheric Administration. Retrieved March 11, 2014. ^ Miller, Ken. "Rare August tornado sends 30 to hospital in Tulsa; no deaths" Fox23 News. August 6, 2017. Accessed August 7, 2017. ^ United States Census Bureau. "Census of Population and Housing". Archived from the original on May 12, 2015. Retrieved August 30, 2014. ^ "Population Estimates". United States Census Bureau. Archived from the original on May 22, 2014. Retrieved August 30, 2014. ^ Bram, Thursday. "Jewish Life in the Bible Belt". New Voices Magazine. Archived from the original on February 19, 2007. Retrieved May 7, 2007. ^ "Tulsa (city) QuickFacts from the US Census Bureau". Quickfacts.census.gov. Archived from the original on March 22, 2009. Retrieved June 4, 2013. 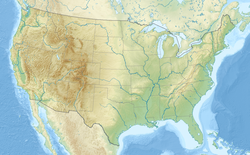 ^ "State and County Quickfacts – Metropolitan Statistical Area". United States Census Bureau. Retrieved July 15, 2007. ^ "Oklahoma Apartments in Oklahoma". Oklahoma Apartments. Archived from the original on April 28, 2012. Retrieved April 29, 2012. ^ Bell, Leigh (April 5, 2007). "Metro Area growth nearing 7 digits". Tulsa World. Retrieved April 13, 2007. ^ Bram, Thursday. "Jewish Life in the Bible Belt". New Voices Magazine. Archived from the original on January 21, 2007. Retrieved August 5, 2007. ^ Sherman, Bill (April 29, 2007). "Minister's book plunges into cultural issues". Tulsa World. Archived from the original on September 10, 2016. Retrieved July 2, 2016. ^ "U.S. Religious Landscapes Survey". The Pew Forum on Religion and Life. Retrieved January 30, 2019. ^ Shevitz, Amy Hill. "Jews". Encyclopedia of Oklahoma History. Oklahoma Historical Society. Retrieved August 14, 2016. ^ Kimberly French, "The gospel of inclusion: A black Pentecostal bishop embraces Universalism, befriends a Unitarian minister, and shakes up the largest congregation in the UUA." UU World, Fall 2009. ^ "Biggest in the U.S.: That Now Describes The First Unitarian Society Of Madison, And In 15 Years It Has Doubled To 1,300 Members", Wisconsin State Journal, December 26, 2003. ^ "A Brief History of the Southwestern Unitarian Universalist Conference" at Southwestern Unitarian Universalist Conference website (retrieved July 17, 2009). ^ "A Brief History". usoga.org. Retrieved May 26, 2014. ^ a b c Winslow, Laurie (January 25, 2007). "Job gains make 2006 record year". Tulsa World. Retrieved June 30, 2007. ^ "About Tulsa". Tulsa Metro Chamber. 2007. Archived from the original on July 20, 2007. Retrieved April 27, 2007. ^ "Tulsa, OK: Best Places to do Business 2006". Forbes Magazine. 2006. Retrieved July 23, 2006. ^ "Economic Profile and Forecast" (PDF). Tulsa Metro Chamber. 2005. p. 3. Archived from the original (PDF) on November 16, 2006. Retrieved April 14, 2007. ^ "Tulsa's Largest Employers". Tulsa Metro Chamber. pp. 3–5. Archived from the original (DOC) on November 16, 2006. Retrieved April 27, 2006. ^ "Small Business Awards to honor Tulsa area business leaders". Tulsa Metro Chamber. May 14, 2006. Retrieved April 27, 2006. ^ "2006 Oklahoma Economic Outlook" (PDF). Oklahoma State University. Center for Applied Economic Research. 2006. p. 1. Retrieved April 14, 2007. ^ Gore, Connie (June 11, 2006). "Cap Rates Turning More Investors Onto Tulsa". Globest.com. Archived from the original on September 28, 2007. Retrieved July 23, 2006. ^ "Tulsa Today: Average Tulsa Apartment Rents Improve". Retrieved October 27, 2010. ^ "GrowMetroTulsa.com". GrowMetroTulsa.com. Archived from the original on July 30, 2013. Retrieved June 4, 2013. ^ "Tulsa's Future program announces near-record 907 jobs in January". Tulsa World. February 4, 2013. Retrieved June 4, 2013. ^ "American's TUL Maintenance & Engineering Base Sets Goal to Achieve $500 Million in Revenue, Cost Savings By End of 2006". American Airlines. Archived from the original on October 1, 2005. Retrieved July 14, 2007. ^ "Tulsa Port of Catoosa". Catoosa Chamber of Commerce. Archived from the original on November 19, 2007. Retrieved July 14, 2007. ^ a b c "Case Study:Tulsa International Airport" (PDF). Johnson Controls. 2007. Archived from the original (PDF) on August 8, 2007. Retrieved July 18, 2007. ^ "Oklahoma South Kansas UAS cluster". Retrieved July 11, 2016. ^ "Amazon announces Tulsa fulfillment center | Grow Metro Tulsa". www.growmetrotulsa.com. Retrieved August 8, 2018. ^ a b c "Tulsa's Public Art". Tulsa Metro Chamber of Commerce. Archived from the original on March 29, 2006. Retrieved May 11, 2006. ^ "Philbrook Museum of Art". Tulsa Metro Chamber of Commerce. Archived from the original on March 29, 2006. Retrieved April 15, 2006. ^ "The All-Terrain Vacation". Travelok.com. Archived from the original on April 10, 2006. Retrieved April 12, 2006. ^ "Oklahoma Aquarium". Tulsa Convention and Visitors Bureau. 2007. Archived from the original on March 29, 2006. Retrieved April 20, 2006. ^ "Sherwin Miller Museum of Judaism". Sherwin Miller Museum of Jewish Art. Archived from the original on February 26, 2010. Retrieved April 20, 2006. ^ "World's Largest Praying Hands". Roadside America. Retrieved May 11, 2007. ^ "Sculpture dedicated to Cyrus Avery, the 'Father of Route 66'" Archived July 14, 2015, at the Wayback Machine, KJRH. November 9, 2012. Accessed July 6, 2015. ^ Barber, Brian (May 18, 2008), "Cyrus Avery plaza's construction nearly finished", Tulsa World. Accessed July 6, 2015. ^ ""It's a big part of our history: City should resurrect 11th Street bridge over Arkansas River, preservationists say". Kevin Canfield, Tulsa World, January 30, 2019. Retrieved January 30, 2019. ^ John Klein, “Landmark Rises on Route 66,” Tulsa World, November 27, 2018. ^ "Tulsa Landmarks". Best of Tulsa. Archived from the original on April 27, 2007. Retrieved April 26, 2007. ^ "History of Theatre Tulsa". Theatre Tulsa. Archived from the original on June 30, 2007. Retrieved April 26, 2007. ^ Stancavage, John (July 15, 2006). "Selling Tulsa: Branded". Tulsa World. Archived from the original on August 11, 2007. Retrieved April 26, 2007. ^ "National Register of Historic Places – Oklahoma, Tulsa". National Register of Historic Places. Retrieved July 14, 2007. ^ "Honors and Awards". Discoveryland!. Archived from the original on April 5, 2007. Retrieved April 26, 2007. ^ "Tulsa Zoo is Crowned King of the Jungle". Microsoft Games. October 4, 2007. Archived from the original on April 17, 2006. Retrieved April 25, 2006. ^ "Zoo History". Tulsa Zoo and Living Museum. 2007. Archived from the original on September 28, 2006. Retrieved April 25, 2006. ^ "December 2005 Revision to Master Plan Proposal". Tulsa Audubon Society. April 7, 2007. Archived from the original on January 12, 2006. Retrieved April 25, 2006. ^ "2005 Tulsa State Fair Stats Preliminary Numbers". Tulsa State Fair. 2006. Archived from the original on October 23, 2006. Retrieved April 15, 2006. ^ Harrison, Daniel. "Top 10: American Oktoberfest Destinations". Ask Men. Retrieved May 5, 2007. ^ Bell, Leigh (May 21, 2007). "Weather, crowd holds up until end of Mayfest". Tulsa World. Retrieved September 4, 2012. ^ "Mayor's Office for Neighborhood". City of Tulsa. 2005. Retrieved May 21, 2007. ^ "Rides disappearing at Bells". KOTV. January 27, 2007. Archived from the original on July 15, 2007. Retrieved April 15, 2006. ^ Downing, Jim (January 2006). "Tulsa Rocks Part Two: The Tulsa Sound". Tulsa Today. Retrieved June 23, 2008. ^ "Famous Musicians from Tulsa". Tulsa City-County Library. Archived from the original on March 14, 2007. Retrieved April 29, 2007. ^ Cary Aspinwall (May 10, 2008). "David Cook: Back in Blue Springs". Tulsa World. Retrieved May 25, 2008. ^ "2012 good for Oklahoma's musicians". Tulsa World. December 23, 2012. Retrieved June 4, 2013. ^ "Tulsa's Music Scene Makes Top 10 List". KTUL.com. Retrieved June 4, 2013. ^ Wilson, Linda D. "Barbecue". Oklahoma Historical Society. Retrieved August 14, 2016. ^ Vaughn, Daniel (May 28, 2014). "Texas Monthly BBQ". Retrieved August 14, 2016. ^ Davis, Ardie (January 23, 2014). "Barbecue 'Oklahoma Tenderloin' hard to find in KC — that's no baloney". The Kansas City Star. Retrieved August 17, 2016. ^ Schallner, Nancy. "Lebanese Steakhouses". Tulsa Gal. Retrieved August 14, 2016. ^ Gainey, Spencer Livingston (December 8, 2015). "BBQ bologna: Oklahoma's legendary Lebanese steakhouses". NON DOC. Retrieved August 14, 2016. ^ Everett, Dianna. "Chili". Oklahoma Historical Society. Retrieved August 14, 2016. ^ Cauthron, Matt. "One Hot Dog: How Tulsa Became a Coney Town". Retrieved July 26, 2015. ^ Stern, Jane; Stern, Michael (2009). 500 Things to Eat Before it's Too Late:and the Very Best Places to Eat Them. Houghton Mifflin Harcourt. ISBN 978-0-547-05907-5. ^ Everett, Dianna. "HOLY TRINITY GREEK ORTHODOX CHURCH (Tulsa)". Oklahoma Historical Society. Retrieved August 14, 2016. ^ Everett, Dianna. "State Meal". Oklahoma Historical Society. Retrieved August 14, 2016. ^ Everett, Dianna. "Peanuts". Oklahoma Historical Society. Retrieved August 14, 2016. ^ Cherry, Scott; Watts, James (May 5, 2013). "Where, why and how: 5 great chicken-fried steaks at area eateries". Tulsa World. Retrieved August 14, 2016. ^ Weaver, Bobby. "Chicken-Fried Steak". Oklahoma Historical Society. Retrieved August 14, 2016. ^ Middleton, Nicole Marshall. "Grape Dumplings Make Unique Dessert with American Indian Influence." Tulsa World. March 14, 2012. Retrieved March 15, 2012. ^ Zanger, Mark (2008). The American Ethnic Cookbook for Students. Phoenix, AZ: Oryx Press. p. 61. ISBN 978-1573563451. Retrieved August 14, 2016. ^ Hibdon, Glenn (July 29, 2007). "Pro soccer: Soccer comes to Tulsa". Tulsa World. Retrieved July 29, 2007. ^ "History of Basketball in Oklahoma". Oklahoma Historical Society. Archived from the original on December 8, 2006. Retrieved April 20, 2006. ^ "Tulsa Wins First CBI Title". Associated Press. Archived from the original on May 31, 2008. Retrieved April 22, 2008. ^ "University of Tulsa CFB Data Warehouse". CFB Data Warehouse. 2009. Archived from the original on March 30, 2009. Retrieved August 14, 2009. ^ "Oral Roberts University (NCAA) Men". USBASKET. 2007. Retrieved April 25, 2006. ^ a b "Southern Hills Country Club is rich in History". PGA. 2007. Retrieved April 20, 2006. ^ Tramel, Jimmie (November 19, 2008). "Lack of sponsor ends LPGA tourney's run". Tulsa World. Retrieved November 19, 2008. ^ Writer, P.J. LASSEK World Staff. "Country music star is on deck". Tulsa World. Retrieved April 26, 2018. ^ "In The Loop, 2nd Quarter 2007" (PDF). Tulsa Downtown Unlimited. 2007. p. 3. Archived from the original (PDF) on June 14, 2007. Retrieved May 3, 2007. ^ "The Story of the Oklahoma/Arizona Outlaws". usfl.info. p. 3. Archived from the original on July 6, 2008. Retrieved June 27, 2008. ^ "Football Team Rankings". Rivals High. Archived from the original on June 17, 2008. Retrieved June 27, 2008. ^ "2008 Route 66 Marathon". 2008 Route 66 Marathon. 2009. Archived from the original on July 15, 2011. Retrieved January 8, 2009. ^ "Tulsa Run. The History of a Fall Classic". Tulsa Run. 2007. Retrieved June 8, 2007. ^ "FAQ – OSF Gambling Compliance". OSF – Gaming Compliance Unit. State of Oklahoma. 2007. Retrieved April 30, 2006. ^ "2016 Annual Report - Tulsa Park and Recreation Department." 2016. Accessed May 25, 2017. ^ "Tulsa: Home to Black Wall Street". 1888articles.com. 2010. Archived from the original on July 7, 2011. Retrieved August 6, 2010. ^ "History of Woodward Park". Tulsa Garden Center. 2005. Archived from the original on April 14, 2006. Retrieved April 25, 2006. ^ "Donors". www.gatheringplace.org. Gathering Place. Retrieved November 8, 2018. ^ "Gathering Place Story". www.gatheringplace.org. Gathering Place. Retrieved November 8, 2018. ^ Brown, Patricia. "Transforming Tulsa, Starting With a Park". www.nytimes.com. The New York Times. Retrieved November 8, 2018. ^ "Attractions". www.gatheringplace.org. Gathering Place. Retrieved November 8, 2018. ^ "Tulsa's Gathering Place named the Best new Attraction in the nation". USA Today 10Best. Retrieved January 31, 2019. ^ a b c "About the Tulsa City Council". The Tulsa City Council. Archived from the original on July 6, 2007. Retrieved April 17, 2007. ^ WADE, JARREL. "Voters elect G.T. Bynum as next mayor". tulsaworld.com. ^ Krehbiel, Randy (May 4, 2007). "Vice President Visits Tulsa: Cheney, Inhofe blast Democrats' plan for Iraq". Tulsa World. Retrieved May 6, 2007. ^ "Wood concedes race for city auditor to Doerflinger". Tulsa World. November 10, 2009. Retrieved November 11, 2009. ^ "39 new Tulsa police officers bring department to full force". Tulsa World. December 22, 2012. Retrieved June 4, 2013. ^ "New Tulsa Police Officers Ready To Serve". NewsOn6.com. Retrieved June 4, 2013. ^ "Wider Pattern Of Gang Violence Seen". The New York Times. November 5, 1986. Retrieved March 8, 2019. ^ Griff Palmer (August 17, 1986). "Street Gang Rumors Surface in Tulsa". Newsok.com. Retrieved March 8, 2019. ^ Tim Barker (January 2, 1991). "City Homicide Mark Lives On". tulsaworld.com. Retrieved March 8, 2019. ^ Chris Casteel (July 7, 1991). "Tulsa Housing Projects Symbols of Scandals". Newsok.com. Retrieved March 8, 2019. ^ Anthony Thornton (December 11, 1988). "Tenants of Tulsa Complex Fear Thought of Relocating". Newsok.com. Retrieved March 8, 2019. ^ "Tulsa Central History". tulsacentralalumni.org. ^ "(OKC) District's enrollment growth a tale of demographic shifts" (ASP). Daily Oklahoman. November 6, 2009. Retrieved November 6, 2009. ^ Kantrowitz, Barbara (May 16, 2006). "The 100 Best High Schools in America". Newsweek. Archived from the original on April 20, 2006. Retrieved April 20, 2006. ^ a b "About the Tulsa City-County Library". Tulsa Metro Chamber. 2007. Archived from the original on June 3, 2006. Retrieved April 28, 2006. ^ "Mizel Jewish Country Day School". Retrieved August 14, 2016. ^ "Peace Academy". Retrieved August 14, 2016. ^ "Catholic Schools". Tulsa Metro Chamber. Archived from the original on February 8, 2007. Retrieved May 3, 2006. ^ "About the Library". Tulsa City-County Library. Retrieved April 15, 2006. ^ a b "McFarlin Library". University of Tulsa. 2007. Archived from the original on September 6, 2006. Retrieved April 28, 2006. ^ "Depository Libraries". Oklahoma State University. June 6, 2005. Archived from the original on May 3, 2006. Retrieved April 28, 2006. ^ "University of Tulsa Fast Facts". University of Tulsa. 2009. Archived from the original on August 22, 2008. Retrieved March 3, 2009. ^ "University of Tulsa Points of Pride". University of Tulsa. 2009. Archived from the original on August 22, 2008. Retrieved March 3, 2009. ^ "About ORU". Oral Roberts University. 2007. Archived from the original on December 31, 2006. Retrieved April 28, 2006. ^ "Oral Roberts University Ranked Tops by The Princeton Review and U.S. News and World Report". Oral Roberts University. 2007. Archived from the original on October 21, 2007. Retrieved March 3, 2009. ^ "TCC/OSU-Tulsa Admissions". OSU-Tulsa. 2007. Archived from the original on March 10, 2007. Retrieved May 4, 2007. ^ "TCC & OSU-Tulsa: The Home Advantage". OSU-Tulsa. 2007. Archived from the original on May 5, 2006. Retrieved April 29, 2006. ^ "Spartan School of Aeronautics FAQ". Spartan School of Aeronautics. 2006. Archived from the original on May 18, 2007. Retrieved May 7, 2007. ^ "About Tulsa Tech". Tulsa Technology Center. 2007. Archived from the original on May 4, 2006. Retrieved May 7, 2006. ^ Education Corporation of America. "Tulsa, OK Career College - Virginia College". vc.edu. ^ "History of Oklahoma Technical College". Retrieved February 18, 2019. ^ "About Tulsa Tech". Archived from the original on April 2, 2015. Retrieved April 6, 2015. ^ "2006 Top 100 Daily Newspapers in the U.S. by Circulation" (PDF). BurrellesLuce. 2006. Retrieved March 2, 2007. ^ "The Tulsa Tribune". Soylent Communications. 2006. Retrieved May 7, 2007. ^ "Urban Tulsa Weekly, alternative publication, reportedly closes its doors after more than 20 years". KJRH. November 5, 2013. Archived from the original on April 27, 2018. Retrieved April 26, 2018. ^ D.R. Stewart (July 8, 1999). "TCI cable traded". Tulsa World. World Publishing Company. Retrieved July 10, 2017. ^ D.R. Stewart (March 22, 2000). "Cox takes over TCI". Tulsa World. World Publishing Company. Retrieved July 10, 2017. ^ "Oklahoma Publicly Funded Transportation Systems". Oklahoma Department of Transportation. Archived from the original on January 11, 2006. Retrieved April 29, 2006. ^ Nichols, Bill (November 23, 2005). "Pump prices dip below $2 in some states; still up from '04". USA Today. Retrieved April 29, 2006. ^ "2005 Annual Average Daily Traffic" (PDF). Oklahoma Department of Transportation. 2005. Archived from the original (PDF) on June 5, 2007. Retrieved April 15, 2006. ^ Route 117 and 118 Proposed Changes Archived June 25, 2013, at the Wayback Machine. Tulsa Transit (June 3, 2013). Retrieved on August 17, 2013. ^ "City unveils Bus Rapid Transit stop that 'will open the entire city' from downtown, official says". Tulsa World. Retrieved January 16, 2019. ^ "Red Carpet Charters website". Red Carpet Charters. Retrieved January 9, 2019. ^ "Our Charter Bus Network". www.Trailways.com. Retrieved January 9, 2019. ^ a b "Riverside Jones Airport". Tulsa Airport Authority. Archived from the original on August 22, 2011. Retrieved October 7, 2011. ^ Casey Smith, “Tulsa Airport board approves operation deal with Okmulgee Regional Airport,” Tulsa World, May 15, 2015. ^ Larry Levy, “Contract awarded for airport control tower," Tulsa Business & Legal News, May 18, 2016. ^ "Here for the long haul: BNSF Railway investments mirror footprint in Oklahoma". Tulsa World. Retrieved December 4, 2018. ^ "Shipping". Tulsa Port of Catoosa. Retrieved December 4, 2018. ^ Barber, Brian (May 1, 2007). "Tulsa Commuters: Rail, Buss Mass Transit Studied: Take the BA train". The Tulsa World. Archived from the original on August 11, 2007. Retrieved May 9, 2007. ^ "Amtrak's Thruway Bus Service". Ribbon Rail Productions. Retrieved May 25, 2008. ^ "Oklahoma's Eastern Flyer takes first voyage". Tulsa World. ^ "After losing bid, Iowa Pacific offers to start regional passenger rail by late May". Tulsa World. ^ a b "Passenger rail between Tulsa and OKC? 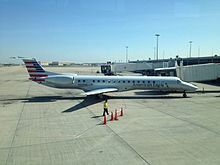 Company seeks another Eastern Flyer operator". Kyle Hinchey, Tulsa World, June 22, 2018. Retrieved January 25, 2019. ^ "Steam Locomotive on the Tulsa Fairgrounds". Archived from the original on July 7, 2015. ^ "Route 66 Historical Village". TravelOK.com. Retrieved January 16, 2019. ^ "Port of Catoosa Profile". Tulsa Port of Catoosa. Archived from the original on March 3, 2006. Retrieved April 22, 2006. ^ "What's new at the port?". Tulsa Port Authority. Archived from the original on July 14, 2007. Retrieved July 30, 2007. ^ "Saint Francis Hospital". Saint Francis Health System. 2006. Retrieved May 7, 2006. ^ "Saint Francis Health System". Health Executive. Archived from the original on September 28, 2007. Retrieved May 7, 2007. ^ "GE Healthcare Announces Preview of Latest Advanced All-Digital Heart Hospital". The Healthcare Sales and Marketing Network. January 13, 2007. Retrieved May 7, 2007. ^ "About St. John". Saint John Healthcare System. Archived from the original on July 16, 2007. Retrieved May 7, 2007. ^ "Southwestern Regional Medical Center". Cancer Treatment Centers of America. Archived from the original on May 7, 2007. Retrieved May 7, 2007. ^ Lassek, P.J (January 12, 2007). "Tulsa mayor chooses to stick with EMSA". Tulsa World. Retrieved May 7, 2007. ^ Barth, Jack (1991). Roadside Hollywood: The Movie Lover's State-By-State Guide to Film Locations, Celebrity Hangouts, Celluloid Tourist Attractions, and More. Contemporary Books. Page 134. ISBN 9780809243266. ^ "Tulsa's Sister Cities". Tulsa Global Alliance. Archived from the original on November 21, 2007. Retrieved November 2, 2007. ^ Sister Cities Archived February 18, 2013, at the Wayback Machine. Tulsa Global Alliance. Retrieved on August 17, 2013. ^ "Stadt Celle". www.celle.de. Retrieved January 5, 2010.